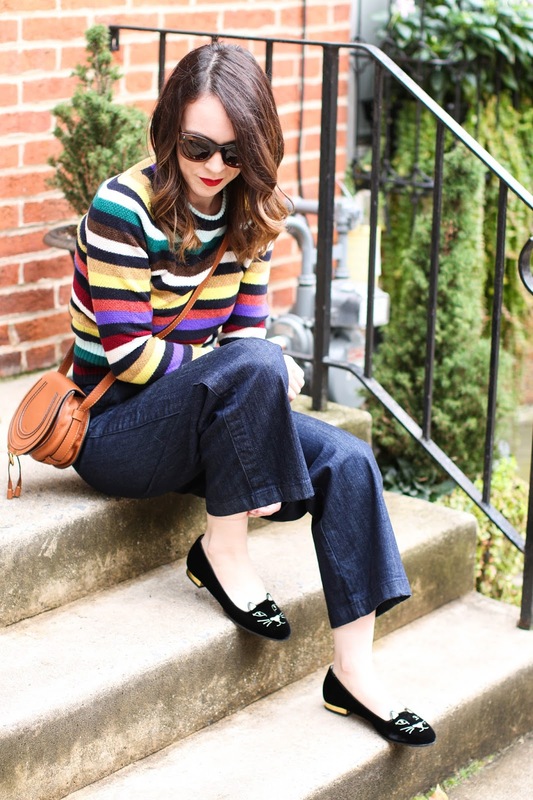 I stepped out of my skinny jean comfort zone with these wide leg trousers, but I love them! I've said before how I struggle with finding jeans (or pants for that matter) that are short enough for my inseam. However, I know J.Crew is famous for their many cropped style pants and when I saw these denim trousers, I figured I would give them a go. As soon as they arrived I immediately fell in love. The legs are wide but bell out gradually still allowing for a slightly slim look. And the fact that they are high waisted is just a bonus for me. My natural inclination would be to wear them with heels but I have not yet worn my Charlotte Olympia flats this season so I figured they would add a fun bit of character to the outfit. 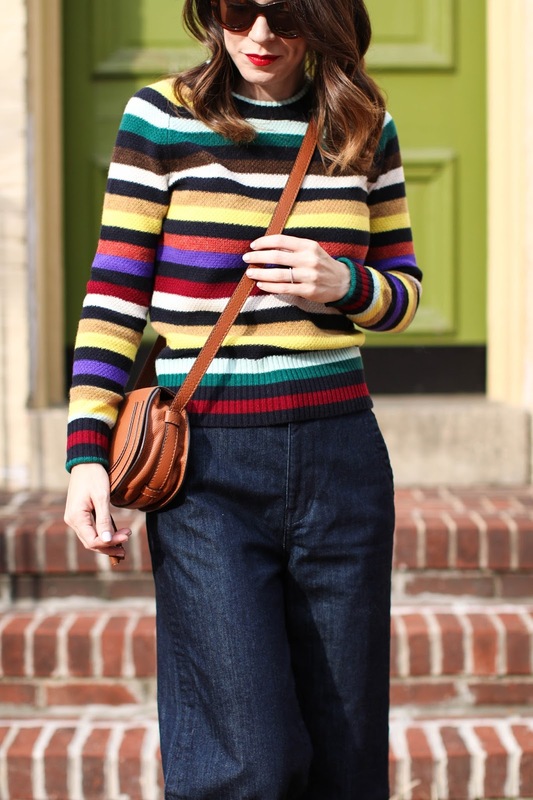 I find that when I shop at J.Crew, I tend to buy a whole outfit rather than just a piece here and there - hence the striped sweater that I couldn't pass up. I loved the look of the two together, though I know each piece will work well with a ton of other items in my closet. No other retailer does cute sweaters quite like J.Crew does so I linked a bunch of ones that I love below in the shopping widget. In addition to all the cute sweaters J.Crew does for the winter season, I have to mention a few other of my favorite items. These gloves are ones I have in multiple colors (and they are tech friendly! ), I adore their scarves, they do some of the best classic boots, this coat has been on my wish list for years and last but not least - pajamas. I already have two pairs of their pajamas and am asking for another pair for Christmas. They are so chic but comfortable as well! 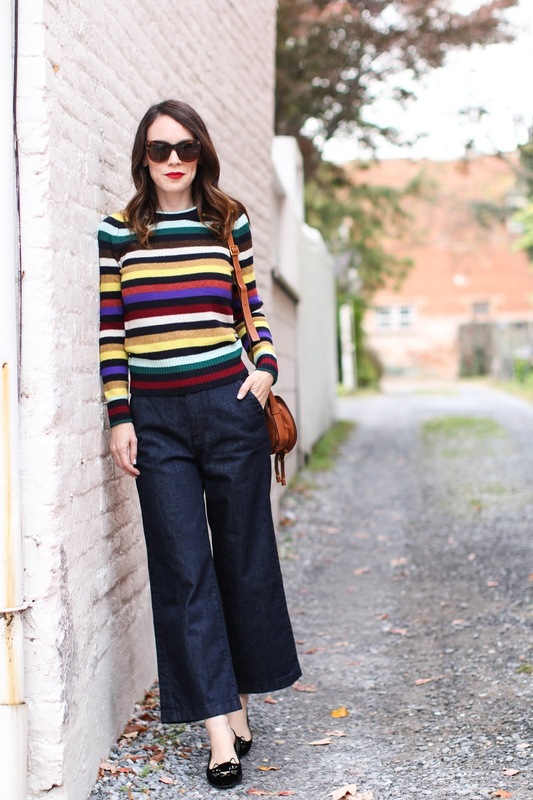 I've been eyeing these wide leg cropped trouser jeans ever since I saw this post. I finally picked them up tonight with the current 40% off sale price promotion! It is final sale though so I sure hope I ordered the right size since these are just fabulous! I absolutely adore mine so I hope you enjoy them just as much!